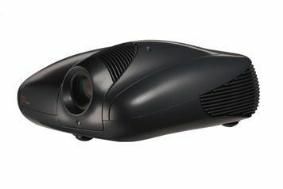 SIM2 starts shipping C3X Lumis DLP projector | What Hi-Fi? We first saw it back in December, and it's available now in standard glossy Gun Metal finish for £24,995 or to special order in white, black or red. The C3X Lumis is a Full HD, three-chip DLP design using the latest 1080p DC4 chipset from Texas Instruments. It also comes equipped with SIM2's redesigned Alphapath light engine and DynamicBlack technology. SIM2 claims a contrast ratio of up to 35,000:1 and brightness up to 3000 ANSI Lumens. The Alphapath light engine features two key components. First, a new die-cast aluminium body improves thermal management of the light engine, which means a more powerful lamp can be used to deliver brighter images. Second, a new tapered rod-integrator is designed to further improve brightness uniformity and efficiency of light transmission. Additional features include two selectable HDMI inputs, plus composite, S-Video, component and VGA connections. Both RS-232 and USB ports are included, as are 12-volt trigger outputs, IR-sensor inputs, various lens options covering a range of throw ratios from 1.31-3.9:1, and anamorphic projection functionality for widescreen reproduction of films in the 2:35:1 format. Head over to the Sim2 website for more information.